Booster positions the EarthGov frigate he has hijacked in the center of Metropolis' gravity calamity and Supergirl, quick to spot his intentions, advises the Legionnaires to get the people they are saving on board. Another EarthGov ship arrives, but insists that it, too, is only looking to help. Just then, Chancellor Pa-Vel raises Supergirl via communicator to let her know that her assistance is needed elsewhere. Superman, having had the Chancellor direct the gravity buoys toward the sun, is battling Doomsday along the line. In telepathic connection with Saturn Girl, Superman, not expecting to survive, asks that somebody tell Lois what happened to him and that both Booster and Kara "find their places." But just as Superman unleashes a final blow that sends Doomsday to his fiery end and leaves him at the mercy of the sun's gravity, a hand reaches out and catches him - the Legion has arrived and have formed a chain of hands sufficient to resist the pull of the sun and keep everyone alive. Later, back on Earth, a young child running away from his mother bumps into Superman on the street. Apparently young Bartholomew Allen is "always running off." Superman notes the name, and sheds a tear for a good friend lost. Then Brainiac arrives and advises Superman that EarthGov has disavowed Minister Niedrigh and that Krypton and Earth are working together to repair one another's damaged infrastructure. Brainiac returns Superman's Legion ring, the one Booster stole in the 25th Century, so that it can make its way back to the museum for Booster to steal it. Time travel headaches ensue. Finally, Clark and Kara say their goodbyes in space. Clark invites Kara to join him back in the 21st Century, and Kara indicates that she probably eventually will, but not before enjoying her latest mission, one that is entirely her own. Here's the problem: the whole thing is built on the edifice of those gravity buoys, which as I've been saying, is pretty weak sauce indeed. They were established under the desperately vague pretense of the Kryptonians not otherwise being able to "fly through space with any kind of purpose," despite being shown to be as perfectly capable of flying around up there unassisted and purposeful as always. This line, this business of "purpose," was then never revisited or otherwise elucidated (I don't count Brainiac's passing reference to a "graviton field" over Metropolis in the final panels of this issue) while the buoys themselves were gradually and almost silently manipulated to serve, it seems, the incredibly felicitous purpose of assisting the non-Kryptonians in that chain of hands. What's my point? None of that was ever needed. 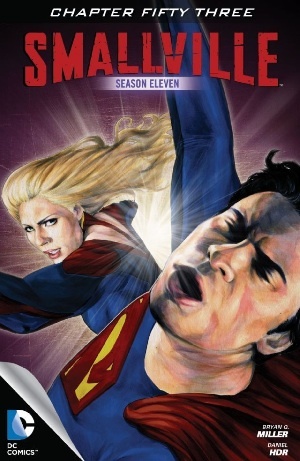 Superman not being able to escape the gravitational pull of the sun is not only not canonical, it is pre-contradicted within Smallville itself by Season 8's "Odyssey," wherein John Jones flies a powerless and arrow-pierced-thus-dying Clark to the heart of the sun in order to restore him to full strength, a trip from which the two heroes return without the aid of any gravity buoys (we have to assume, given that it's still the 21st Century when that happens). And let's not even talk about the fact that Jones lost his powers for this trouble but still managed to survive. Nor does any of this connect with the Faora-as-god-omigod-Doomsday component of this arc. What's this, I say? A retcon? In Smallville? How can this be??? Or how about this: I can imagine that a new planet in the solar system just might affect the overall gravitational dynamics of that system in some way. I can probably expect to find useful information in libraries or on the Internet that could help me fictionalize such a scenario for the purposes of, say, writing a Superman comic book. And I can fathom that something like that is exactly what Miller is thinking. But I can't fathom leaving such a small and altogether unifying detail unsaid. I can't fathom being so imprecise about what, how big and how far away Argo/"Worldship" New Krypton is in relation to Earth while simultaneously building key plot points right on top of those missing details. I guess I just don't feel like "Argo" much grew the wider Smallville universe. More like muddied. Oh well. Time travel, amirite? At least a terrific moment of familial heroism came out of it, for which I am happy to do everybody a favor and give this particular issue top marks, even if almost none of what led us here made the slightest bit of sense. Other than that, it was good to see Booster do something wholly for others, and the exchange between Clark and Imra as Clark battled Doomsday was suitably heartfelt. It's not like I feel bad giving this issue a 5. A final note: I also think the "Bartholomew Allen" moment was a bit of an overreach, only because there's been no Smallville acknowledgment that its incarnation of Bart did indeed originate in the future as he has in other titles. You'd also need to know that for it to be more than just inorganically random. Either way, unlike the chain of Legionnaires, this moment didn't have the intended effect on me, but maybe it's just what would have qualified as fanservice when it was still on TV, so let's call it an Easter egg and we can all be duly satisfied with it. Art - 5: All around good stuff, even if the shiny-happy-people splash page of Legionnaires departing triumphantly from the sun is not to my taste.